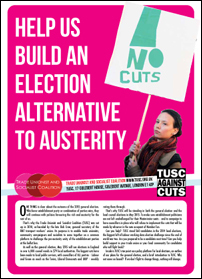 A NEW A3 folded TUSC broadsheet is now available appealing for candidates to stand in next May's elections. The broadsheet includes an outline of our approach to the general election, TUSC's ten-point core policy platforms for local elections, and a brief explanation of what TUSC is and who is involved. It's ideal for distribution at trade union meetings, anti-cuts events and as a general introduction to TUSC on picket lines and protests.